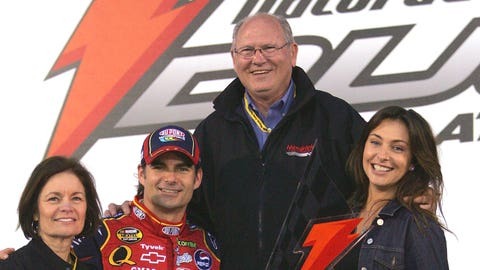 After winning a Gatorade Duel race at Daytona International Speedway in 2007, Jeff Gordon celebrates in Victory Lane with his mother Carol, stepfather John, and his wife Ingrid Vandebosch. 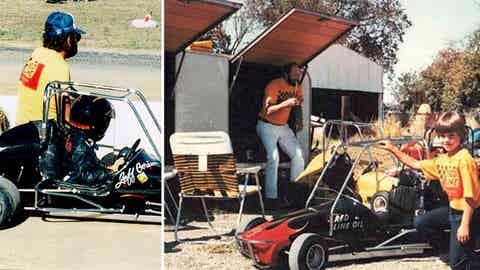 Editor‘s note: John Bickford is Jeff Gordon’s stepfather and the man who got him started racing quarter-midgets as a youngster in Northern California. In 1986, Bickford, wife Carol and Jeff moved from California to Indiana so Jeff could race sprint cars. In an exclusive interview with FOXSports.com, John Bickford tells the story of the family‘s decision to move to Indiana. And on Sunday, Gordon will be back home in Indiana to drive the pace car in the Indianapolis 500. Jeff couldn’t race in California. He had pretty much grown past quarter midgets. We always had the theory that we should be learning, not teaching. And if you’re winning all the time, you’re a teacher, not a learner. So you take that philosophy and you say, "OK, what’s our next step?" In 1984 (editor’s note: Jeff was 13), when we made the decision to go to sprint cars, there was nothing between a quarter midget and a sprint car that you could do without being at least 16 years of age. So we said, "OK, let’s do a sprint car." So we built a sprint car, went to Florida in 1985 to race and Jeff didn’t actually embarrass himself and I didn’t embarrass myself. Many people thought that he did a really good job. We immediately established a lot of confidence in ourselves, came home and we were allowed to hot lap and qualify at Kings Speedway in Hanford, Calif. And the phones started ringing. Two types of phone calls — the promoters and marketing guys at the tracks thought Jeff could sell tickets. "Man, we need you. We need you." And the other phone call was basically Cary Agajanian (famed attorney, promoter and car owner) and a few people saying, "John, he’s not 18, man. At 16, maybe. But at most tracks, you’ve got to be 18 to race." I said, "I think they’ll let him run back east." He said, "I think you ought to look into it." That was March of 1985. Early photos of a young Jeff Gordon getting a start on his driving career. So we went back east and they let us run. We evaluated schools — we’re parents — and so you’re thinking about schools, thinking about the future, thinking about what life costs, what a sprint car costs. We raced there all summer and we said, "You know what? If we can put some stuff together, let’s move to Indiana. We want to run the Indianapolis 500 some day. Let’s go put ourselves as close to all the racing people, and we’ll run sprint cars, and when we get old enough, hopefully we’ll be ready to find a ride at Indianapolis Motor Speedway." So we positioned ourselves in Pittsboro, Ind., which was close to where the car was made in Jamestown. We were close to the Speedway. Everybody seemed to be right there. We packed up our stuff in 1986 and we just moved there. We carved out a life. We didn’t know anybody, but we kind of carved out a life and made great friends. Jeff grew up, went to school, made life friends there. We made life friends there. It was one of those things where we always thought we were going to be at the Indianapolis 500 and it just, not unlike NASCAR, it’s getting to the point where you buy a ride. You have to bring money. We arrived about two years after you were hired on performance. You were about two years into buying rides. We just didn’t know any better. We started talking to car owners and they’d say, "Yeah, Jeff would be great. How much money can you bring? We need about $5 million or $6 million." I said, "I don’t have $5,000. How am I going to get $5 million?" So when the opportunities came to possibly drive a stock car, we said, "Well, we never thought about that but maybe we should try it." So Ken Schrader told me, "You need to go see Buck Baker if you want to figure out a stock car. I think Jeff would be fine in it." It was 1990. Jeff couldn’t even rent a car. Carol had to take him to Buck Baker Racing School in Rockingham, N.C. And Jeff called me on the phone and said, "I think this is what I want to do. I can drive these cars. And they race. And they want to race down here. This is all about racing. This isn’t about getting in and going fast and being really careful. They’ll push you around down here. I think I can do this." And Hugh Connerty (a restaurant owner) came along. Hugh was a friend of Buck Baker’s and was there and he was (NASCAR team owner) Leo Jackson’s son-in-law. He said, "Jeff, I really think you can drive a car. I’ll hire you to drive my (NASCAR Busch Series) car." And that’s pretty much the story. Andy Petree was involved. Steve Barkdoll had asked Ray Evernham to help his dad, Phil Barkdoll, out. So they said, "Well, we’ll call Ray and see if Ray will come down here and help us with this deal. We have no money. We’ve got a car and we’ve got some help and we’ll rent a motor and we’ll do all this stuff." And so this hodgepodge little group of guys all got together. We came out to Charlotte Motor Speedway and it rained and we had no points and missed the race. We skipped New Hampshire and two weeks later was Rockingham and they put it on the front row. This little team of, like, five guys. Benny Parsons, a longtime friend of Jeff’s, came up to him and said, "I always expected I’d see you here one day." It was great and Jeff never forgot that. And that’s pretty much how it happened.